Baru Cormorant believes any price is worth paying to liberate her people—even her soul. 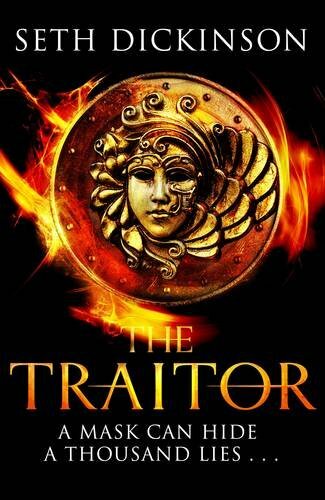 When the Empire of Masks conquers her island home, overwrites her culture, criminalises her customs, and murders one of her fathers, Baru vows to swallow her hate, join the Empire's civil service, and claw her way high enough to set her people free. I like to think of myself as a relatively well-mannered man, but if, a year or so ago, you'd told me that one of 2015's very finest fantasies would come from the same creator who gave the video game Destiny its at best forgettable flavour, I dare say I may have laughed in your face. That would have been my mistake, because The Traitor Baru Cormorant (AKA The Traitor in the UK) is, as it happens, practically masterful—not a word I can recall deploying to describe a debut in all the years I've been a book reviewer, but in the complete and total control Seth Dickinson demonstrates over his intricately crafted narrative and characters, this is exactly that: a first novel so clever and subversive that it bears comparison to K. J. Parker's best and most messed-up efforts. The titular traitor is but an innocent in the beginning. Beloved by her mother, Pinion, and her fathers, Salm and Solit, Baru Cormorant is a precocious so-and-so at seven, with a passion for mathematics and a habit of staring at the stars, so when the Masquerade invades tiny Taranoke—bearing life-changing gifts, initially, such as sanitation and better education—she's secretly pleased. Years pass as the pages of Dickinson's debut fly by, like the birds Baru once watched. Having excelled in her studies, particularly in arithmetic, our would-be hero has every reason to believe she'll be sent to Falcrest, the very centre of the Masquerade's machinations, from where she means to rework the wickedness of the world. Instead, Baru is bundled off to another island, and in Aurdwynn, unrest is on the rise. The long and short of its situation, as the words carved on the gates of Treatymont warn, is that "Aurdwynn cannot be ruled," (p.50) but if Baru is to stand a chance of righting the wrongs wrought by the empire she now essentially represents, she'll have to bring the island's disparate peoples to heel. They're not going to make it easy, either. "She was eighteen, foreign, a woman—and here in Aurdwynn they did not even pretend that this was not a disadvantage to the ambitious." (p.55) But hey, if anyone can find a way, Baru Cormorant can. She even has a plan, though what she'll have to sacrifice to enact it is no laughing matter. Her innocence is at this stage already long gone; her deepest beliefs are sure to follow shortly; you have to wonder what's she got left to give. And that's just the first act of The Traitor Baru Cormorant. The difficult choices its protagonist must make in the later phases of the fiction make the few I've given away feel like child's play, and those that feature in the uncomfortable finale are so indescribably dark that readers are guaranteed to leave Dickinson's debut reeling. At the risk of repeating myself, this is a truly brutal book; an unforgiving thing that will challenge you through and through. The incredible complexity of Baru's character rests at the root of this dispute. For a number of reasons, we feel for her from the first. Her suffering makes her sympathetic; because of her strength and intelligence, her perspective has real appeal; and her resolve to right the Masquerade's wrongs renders her an underdog, ultimately, raging righteously against an obscene and merciless machine. Yet the many mechanisms of that machine mean that Baru has no alternative but to fight fire with fire: to oppress others—innocents, as often as not—in much the same way she and her people were treated; to cause pain in the very same vein as that which set her on the path she follows in this novel. Too soon, this serves to narrow the chasm between her and her enemies—between the apparent good guys of this book and the bad—until it's difficult to tell the difference. Difficult for us, and difficult, furthermore, for her, because Baru is as aware as we are of how utterly corrupt she runs the risk of becoming. "What loyalty did she really have behind the mask?" (p.135) she sometimes wonders—as indeed do we. To tell the truth, Baru is terrifying at times; a barely-suppressed scream of a human being—yet we want what she wants. We stand solidly in her corner, refusing and excusing all the evidence that gathers against her. 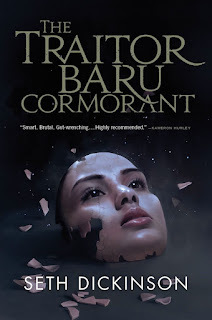 Be she traitor or patriot by the end of the book—to who might be the more pertinent question—Baru Cormorant must be the most memorable character fantasy fiction will feature in 2015. Happily, the narrative Dickinson designs around her is every inch as rich and convincing. His debut is paced like a race—excepting some slight slowdown in advance of a surprisingly action-packed last act—and never less than poetically put. Similarly, the text's setting impresses. Though we only see a couple of corners of the world I full well believe Baru will one day bring to its knees, Aurdwynn and to a necessarily lesser extent Taranoke are both impeccably rendered—in place and time and in texture and tension. That said, I look forward to setting foot in Falcrest itself in the sequel I suddenly need. 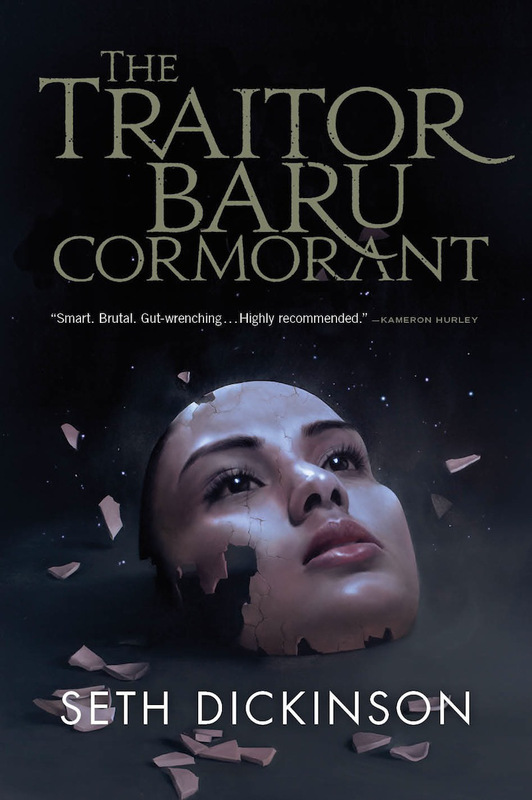 All told, The Traitor Baru Cormorant is a devastating debut—and doubly so due to a twist in the tale I'll be damned if Dickinson doesn't nail. A financial fantasy reminiscent of nothing so as The Folding Knife, it's filling, chilling and thoroughly thrilling.